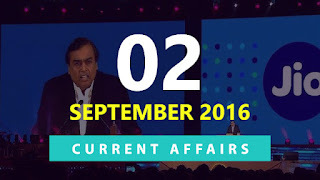 Hi Aspirants, here is the Current Affairs Quiz for 2 September 2016 in MCQ format. This Quiz will be very useful for all upcoming SSC, Banking, Insurance, RBI and other exams. Click the ‘START QUIZ’ button to attempt the quiz with Multiple Choice Options. 1. 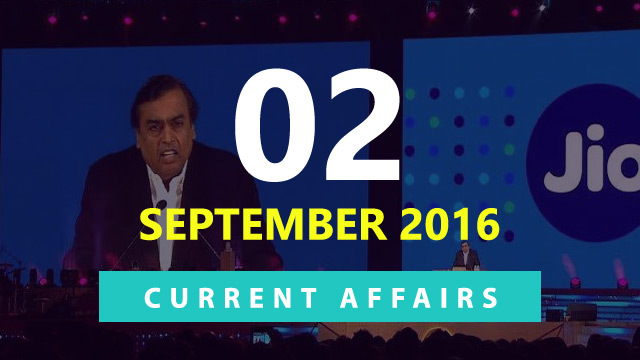 Name the new mobile operator which officially launched on 1 September 2016? 2. International Day Against Nuclear Tests was observed on? 3. Guinness World Records on 1 September 2016 declared Majuli as the largest river island in the world. Majuli is in which state? 4. Which rocket of SpaceX was destroyed recently in an explosion during a propellant fill operation? 5. Which bank has recently launched USSD (unstructured supplementary service data) based ‘*99#’ mobile application? 6. Railway Minister Suresh Prabhu on 1 September 2016 launched an insurance scheme for passengers travelling on e- ticket. The insurance cover will be up to ___ lakh rupees? Note: The insurance coverage will be available in case of train accidents and other untoward incidents, including terrorist attack, dacoity, rioting, shooting or arson. 7. Carnatic singer Thodur Madabusi Krishna and Bezwada Wilson, campaigner for eradication of manual scavenging, on 31 August 2016 received which prestigious award? 8. The 2016 Summer Paralympics will start on 7 September 2016 in which city? 9. Former West Indies paceman Courtney Walsh was recently appointed as the specialist bowling coach of which team? 10. Which company on 31 August 2016 announced the acquisition of sports broadcasting business of Zee Entertainment for 385 million US dollar in an all-cash deal?